This Monster of the Week is going to be a little different. Instead of talking about a monster that we’ve already identified, we’re going to play find the monster. —the house at number ten, Cloverfield Lane. Phew. Sorry. I got a little carried away, there. I saw this movie a few weeks ago—without having seen the original Cloverfield—and it definitely stands on its own. I was impressed by how smart and intimate a horror movie it was. It relies a lot on its cast, with very good results. Let me get a quick disclaimer out of the way before we get in too deep—okay, two disclaimers. One: thar be spoilers ahoy. If you haven’t seen the movie, I will ruin everything.Everything! You’ve been warned. Two: I’m actually a relative newcomer to horror movies. I know! What am I doing writing a monster blog? We-e-ell, monsters are actually part of what drew me towards horror movies in the first place. I’ve also tiptoed around the edge of the genre for a long time—I love sci-fi, fantasy, and action movies, many of which have darker moments that utilize horror on a smaller scale. I also love video games. Some of the monsters I’ve fought in these games were just begging to be written about—and when I realized how much I loved the Shadow Temple, how could I say I didn’t like horror? I waded into things I justified as horror comedy—Shaun of the Dead, B-list horror movies with awful effects, Cabin in the Woods—before finally just accepting, no, hey, I like straight-up horror. Why was I so resistant? I had a misconception about horror that I think a lot of us have. I thought it was all over-the-top gore and slasher flicks, movies that are more repulsive than they are scary. Sure, some horror movies are like this. But the genre as a whole is so much bigger than that! Think about how important fear is as a part of the human psyche, how it can make us face the worst parts of ourselves, the philosophical questions it can ask us…. Did I just come out as a horror fan? Gee whillikers, guess that makes this my second coming-out this week! I should throw a party. I’m a newbie to horror movies, so something fresh and exciting to me might not be fresh and exciting to genre veterans. Others who aren’t big horror fans? Ditch any preconceived notions you’ve brought in with you, and embrace the idea that horror films can be smart. 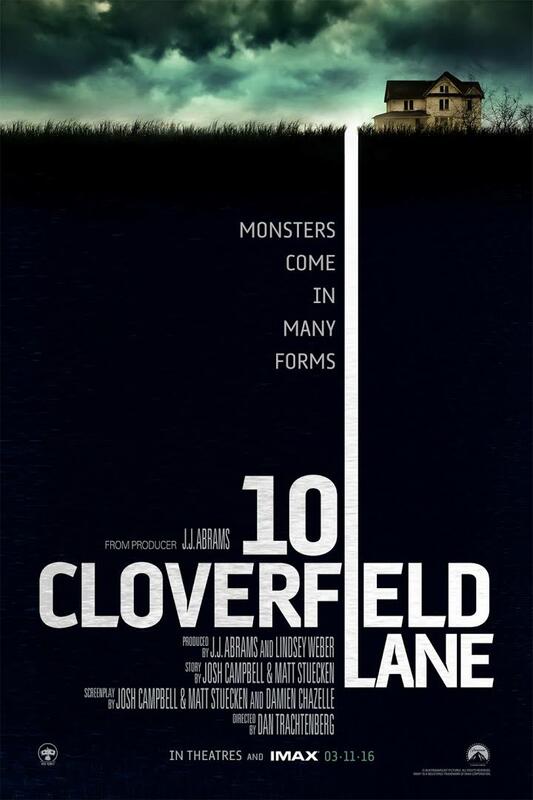 Without further ado, where is the monster in 10 Cloverfield Lane? At the beginning of the movie, our heroine (played by Mary Elizabeth Winstead, who you might recognize as Ramona Flowers) gets knocked out in a car crash. She wakes up in an underground bunker where an uncharacteristically creepy John Goodman tells her that he saved her—and she has to stay in the bunker, because up above the world is ending. There’s a deadly alien plague out there, you see. It’s a pretty far-fetched story, and she doesn’t believe him—even though the only other person in the bunker, a man about her age, says he sheltered there voluntarily. But just before she makes her escape, a woman appears on the other side of the door begging to be let in before she dies of plague. They don’t let her in. They don’t want plague. But it’s tense in the bunker. John Goodman rules with an iron fist, and he may have killed before. The other two survivors start plotting an escape and making a hazmat suit in secret. When their captor finds out, he kills the young man, and insists he’ll protect the woman as long as she stays inside and obeys him. She has to fight for her life to finally escape the house safely. Uh—sorry, did I say safely? The plague has passed outside, sure, but the giant alien monsters are still there. When one attacks her—this is, like, 90% of the way through the movie, by the way—she barely escapes with her life. But. In the very last moments of the movie, she has the chance to run away—and instead, she drives straight to the front lines of the war with the aliens, because she’s a kickass heroine who wants to help others and has completely owned her fear. It’s a pretty great ending. The whole audience cheered. … Okay, maybe that was just in my head. You’re probably thinking that it’s John Goodman. (Isn’t it great when he plays a bad guy? He was so sinister in O Brother, Where Art Thou?) And that’s a good place to start, but I think it’s a little more complicated than that. Let’s go back to the scene where Mary Elizabeth Winstead first wakes up trapped in a bunker. This scene sets the tone for the rest of the movie, and it does so beautifully. Let me first say that the main character’s gender completely alters that tone—very intentionally. The camera frames her—injured, huddled on a mattress at floor-level—against a much larger man at his full height who is clearly prone to angry outbursts. Every time he raises his voice, it’s clear what the heroine is thinking: Will he get violent? Physical? How physical? What is the nature of the possessive attitude he displays towards her? I can’t say how it would feel to watch this scene as someone with a male body, who was socialized as a man, but I was shrinking right back into my theater seat along with her. Because those questions are so familiar. Because that doubt—that fear that labeling someone as a threat is unfair when they could just be well-meaning—always follows right on the heels of those questions, and carries the next one: Am I just paranoid? Because, to anyone who identifies or appears as female, the threat of male aggression is less a question of if than a question of when. 10 Cloverfied Lane is a horror film about misogyny. It’s also about claustrophobia, and paranoia, and the horror that is other people—oh, yeah, and aliens, I guess—but there is a reason that our hero isn’t the young guy. John Goodman’s character is creepy as hell—but he’s also human. As awful as he can be, he has some moments of genuine connection with the other characters. His fear is real. He genuinely wants to protect the people in there with him—genuinely thinks that he has made himself a little family, safely tucked away from the end of the world. That’s what’s tragic about him. That’s what’s terrifying about him. That’s why—as much as he, himself, seems to be the monster—he’s also a victim of it. Misogyny hurts men, too. It made him into something frightening to the person he wanted to protect. Our heroine is well acquainted with this monster, and that’s why she wins. She knows how to use it. She turns Goodman’s controlling ego against him to get his guard down and make a break for it. She knows how to say yes-sir to his face and subvert his rules from inside the house. As much of a victory as it is when she finally escapes Goodman, the movie’s not over yet—because she hasn’t slayed the real monster. No, it’s not the alien, gosh. She tells a story, at one point, about a time when she saw a man being physically abusive to his young daughter in a hardware store. She wanted to say something—but she couldn’t. She just watched, and then they walked away. At the end of the movie, she escapes her own personal prison and comes to a crossroads: she can flee to the coast, where it’s safe, or she can drive up to the front lines of the alien war to help the others who are fighting for their lives. She has the chance to save herself. To let fear make her a bystander. Like this post? Sharing it on social media would be very hip and Web 2.0 of you. Just saying. Hey, thanks for the shoutout, Bex! Great article. Have Monster of the Week and other blog posts delivered straight to your inbox!